In 2015, the top 10 Workforce Management (WFM) software vendors accounted for nearly 39% of the HCM applications market segment which grew 4% to approach $3.6 billion in license, maintenance and subscription revenues. 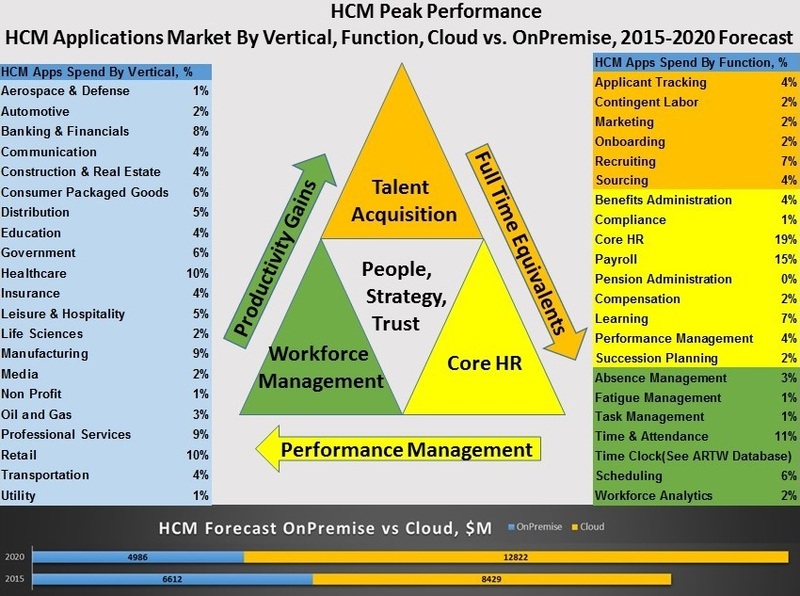 As a whole, Workforce Management (WFM) applications represented 24% of the overall HCM applications market. Last year Kronos was No. 1 in Workforce Management with 18% market share and $658 million in HCM Workforce Management product revenues, achieving a 5% jump in license, maintenance and subscription revenues. ADP was No. 2 with 5% share, Ultimate Software was the third at 5% and Oracle and Verint were fourth and fifth with 3% and 2%, respectively. Through our forecast period, the Workforce Management applications market, which is comprised of six subsegments, is expected to reach $4.6 billion by 2020, compared with $3.6 billion in 2015 expanding at a compound annual growth rate of 5%. For Top 10 vendors in each of the six subsegments in addition to Time Clock Hardware, please check their own index page by following their link below. Here are the rankings of the top 10 Workforce Management (WFM) software vendors, their market shares in 2015 and recent developments. 1 Kronos 625 658 5% 18% With 20,000 customers in the Kronos Cloud, the No. 1 WFM vendor continued to expand by buying Empower for HCM apps in 2016. 2 ADP 200 194 -3% 5% Continues to gain ground in midmarket with Cloud-based Workforce Now, offering 75,000 customers a mix of WFM, Core HR and Payroll products. 3 Ultimate Software 132 160 21% 5% Saw 84% attach rate for its time management applications in third quarter of 2016. In September 2016, Ultimate acquired Kanjoya for workforce analytics. 4 Oracle 101 96 -5% 3% In its latest quarter, Oracle said its Cloud HCM applications sales spiked 131% after signing 436 deals including more than half from new customers. 5 Verint Systems 80 80 0% 2% Focus is on workforce management apps for call center operations. 6 Nice Systems 45 54 20% 2% Signed hundreds of clients in 2016 with its workforce management applications and other enterprise software to help boost customer engagement. 7 WorkForce Software 45 49 9% 1% Acquired Workplace for schedule optimization applications, while expanding its presence in strategic verticals such as government, healthcare, and retail. 8 HotSchedules 45 49 9% 1% Unveiled Global Developer Network for developing solutions on the HotSchedules IoT Platform and the Global Channel Network for reselling the HotSchedules app portfolio. 9 dormakaba Group 41 46 12% 1% Merger between Kaba and Dorma created one of the top three companies for security and access solutions. 10 Reflexis Systems 41 37 -10% 1% Acquired Enfotrust Networks, a provider of vendor performance management and learning solutions for merchandisers, retailers, and manufacturers.